Screen shot of the game Park and Ride from Pretty Good Solitaire. Park and Ride is a one deck game similar to Gaps or Montana. 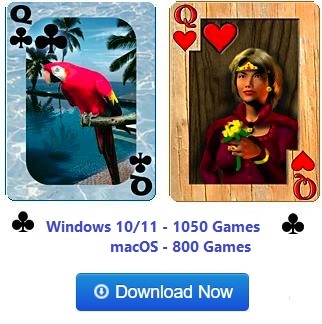 It is the new game in version 18.1 of Pretty Good Solitaire. All 52 cards are laid out in four rows of the 13 cards each. The Aces are removed, leaving four spaces among the rows. 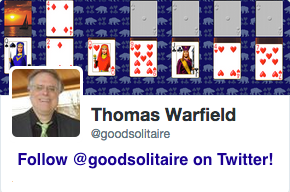 The objective is to create 4 sequences of 12 cards of the same suit, running from Twos to Kings. Play by filling in gaps (spaces) by moving the next highest ranking card in suit to the card to the left of a space into the space, or the next lower ranking card in suit to the card to the right of a space into the space. Do this by clicking on the card to you want to move. For example, if there is a space to the left of the Nine of Spades, find the Eight of Spades and click on it to move it into the space to the left of the Nine. If there is a space to the right of the Four of Clubs, you can click on the Five of Clubs to move it the space. You want to create spaces at the far left of the rows, then you can place Twos in each of the far left spaces. From there you try to build sequences in suit. 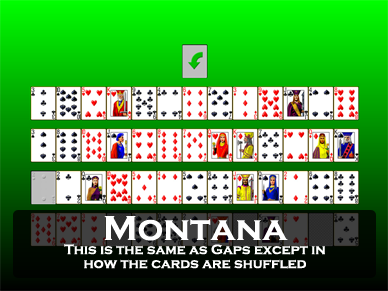 When there are no more possible moves, clicking the redeal with pick up all cards that are not in suit sequence starting from a Two in the leftmost position of the pile and move themrandomly to another location. Once a card is in a position it needs to be in to win the game, it will remain there thru a shuffle. Two shuffles are allowed in Park and Ride. Free Parking is a harder game with only one shuffle. 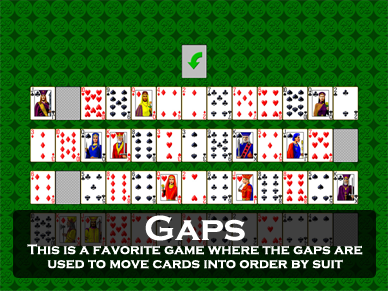 Gaps is also similar, but only allows building to the right of a card.